Watch the Mr. Media interview with author Richard Doetsch, writer of ‘The Thieves of Legend,’ by clicking on the video player above!Mr. Media is recorded live before a studio audience of Robert Ludlum, James Patterson and Clive Cussler heroes who are dealing with the sad truth that they’re simply not as cool as Michael St. Pierre … in the NEW new media capital of the world… St. Petersburg, Florida! Order ‘The Thieves of Legend’ by Richard Doetsch, available from Amazon.com by clicking on the book cover above! I’ve now read five of his six books (he’s also written one vook novella) and they always leave me wanting more. Which reminds me – where is that sequel to my favorite novel in years, The 13th Hour? 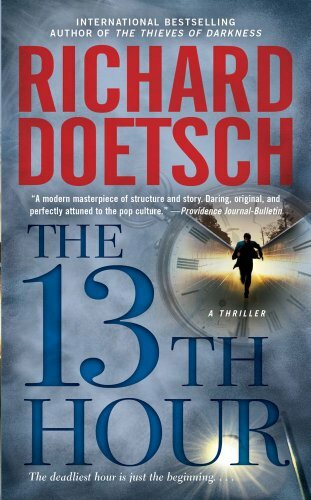 Order ‘The 13th Hour’ by Richard Doetsch, available from Amazon.com by clicking on the book cover above! Doetsch’s sixth adventure-packed tale was just released. The Thieves of Legend reunites Michael St. Pierre and his supporting cast for their wildest globe-spanning challenge yet. 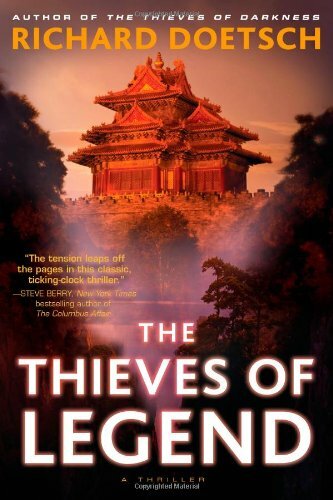 It is the fourth in the Thieves series; I recommend if you’re new to Doetsch’s Thieves that you just order all four now because if you start with the latest, you’re just going to feel compelled to read the rest anyway. This is Doetsch’s fourth appearance on Mr. Media and his second on video. (Catch up on any you missed at MrMedia.com).